Who knew it would be a weekend for breakingÃ‚ records? An unprecedented earlyÃ‚ season snowstormÃ‚ slammed intoÃ‚ the Northeast U.S.Ã‚ eclipsing records for October snowfall and leaving at leastÃ‚ 11 dead and more than two million without power. The latest storm summary from the National Weather Service has snowfall totals by state. A combination of wet, heavy snow falling on trees that had yet to lose their leaves and were already weakened by Hurricane Irene, made for downed trees, branches and power lines, leaving many roads impassable and causing widespread power outages. As we previously reported in the wake of Hurricane Irene, if a tree hitsÃ‚ your home or other insured structure, standard homeowners policies provide coverage for the damage the tree does to the structure and the contents in it. Winter storms are historically very expensive and are the third-largest cause of catastrophe losses, behind only hurricanes and tornadoes. From 1991 to 2010, winter storms resulted in about $26 billion in insured losses, according to ISO. An October snowstorm might be rare, but it’s a reminder to us all that winter is just around the corner. Now is the time to winter-proof your home, according to the I.I.I. Check out I.I.I. facts and stats on winter storms. As the Lady Gagas and Harry Potters come out Monday night, your standard auto and homeowners policies should have you covered in case you receive more tricks than treats. The I.I.I. 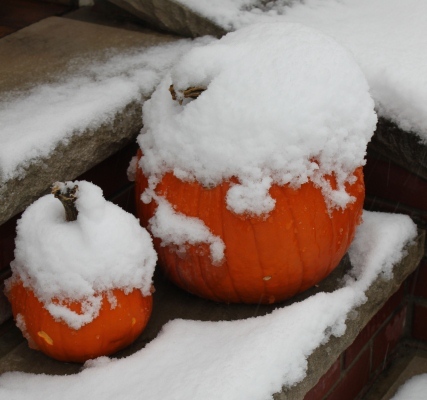 gives several examples of how insurance can protect you from Halloween-related losses. For instance, if your home is damaged in a Halloween prank your homeowners or renters policy provides coverage for vandalism, after the deductible is met. Similarly, if your car is damaged by mischievous trick-or-treaters, there is coverage under the optional comprehensive portion of your auto insurance policy. If you expect to be handing out candy or throwing a Halloween party, again you would be covered if a trick-or-treater or guest is accidentally injured in your house or apartment, the I.I.I. says. The liability portion of your homeowners or renters insurance policy covers you in the event you are sued by the injured party. – Ensure thereÃ¢â‚¬â„¢s a clear path to your front door by removing all objects that could cause children to trip or fall. – Turn your outside lights on if you welcome trick-or-treaters. – Take caution when using candles, jack-o-lanterns, matches and lighters and keep them out of reach of children and away from flammable materials. – Have a plan for your pet especially if they are easily spooked by guests or doorbells. – Motorists need to be extra cautious and watch for children, especially after dark. Earthquakes continue to make their mark on 2011 with the damaging 7.2 magnitude quake in eastern Turkey on Sunday that has left hundreds dead and more than 1,300 injured. The cities of Van, where the quake was centered, and Ercis, 45km to the north, felt the brunt of the quake and hundreds of building collapses have been reported. As PC360 reports, the insurance losses from this catastrophe should be minimal due to low insurance penetration and take-up in the impacted area. A report from catastrophe modeling firm Eqecat puts the preliminary estimate of insured losses from this event is in the range of $100 million to $200 million. Total economic damage is estimated in the low single-digit billions of dollars. Eqecat goes on to note that insured losses will be incurred primarily by the Turkish Catastrophe Insurance Pool (TCIP), a national program of compulsory earthquake insurance for residential buildings. The TCIP, started in 2000, is intended to minimize the rebuilding cost to the central government, and is backed by international reinsurers. Limits per policy are around $30,000, with deductibles commonly 2 percent. However, Eqecat adds that estimates of TCIP penetration hover around 20 percent, and take-up rates in the east are less than this national average. EqecatÃ¢â‚¬â„¢s insured loss estimate is based on much of the damage having struck residential buildings. Damaged buildings will number in their thousands, it adds, as aftershocksÃ‚ cause furtherÃ‚ damage or collapse. Buildings in the region are a mixture of vulnerable and resistant construction. Check out I.I.I. facts and stats on earthquakes and tsunamis. If youÃ¢â‚¬â„¢re questioning the value of your homeowners insurance or how much it costs to insure your home, you might want to take a look at theÃ‚ 2011 Homeowners ROE Outlook report from Aon Benfield Analytics. This updated annual report reveals that homeowners insurance consumers continue to benefit from rates that do not fully reflect the annual cost of insuring a home. The study finds that insurersÃ¢â‚¬â„¢ prospective after-tax return on equity (ROE) for homeowners insurance is 4.8 percent on average, a decrease from 6.9 percent in 2010, mainly due to forecast subdued investment returns and higher estimates of non-coastal losses. Further, Aon Benfield estimates that investment returns will average 3.8 percent during the current annual period, a decline from the 5.0 percent returns seen in prior years. Even excluding this change, insurersÃ¢â‚¬â„¢ prospective ROE would be 6.3 percent, down from 6.9 percent in 2010, and still well below the true cost of capital. The report does show that homeowners insurers appear to have improved their recovery of the cost of reinsurance capital in recent years. However, they could still recover a great share of the annual cost of exposing capital to retained catastrophe losses, according to Aon BenfieldÃ¢â‚¬â„¢s analysis. The annual report analyzes prospective returns on equity for homeowners business based on the July 2011 filings of insurers operating in the 25 largest U.S. states. Even though the first day of winter is still two months away, itÃ¢â‚¬â„¢s not too soon to prepare for the colder weather, at leastÃ‚ according toÃ‚ the latest winter forecasts and outlooks. I.I.I. facts and stats on winter storms tell us that melting snow can inflict significant damage to property, and winter storms are the third-largest cause of catastrophe losses. 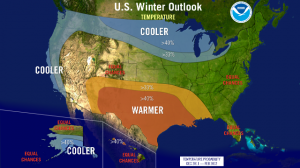 The National Oceanic and Atmospheric Administration (NOAA) just released its annual winter outlook, while in early October Accuweather.com issued its winter 2011-2012 forecast. The Southern Plains should prepare for continued drier and warmer than average weather, while the Pacific Northwest is likely to be colder and wetter than average from December through February. For those of us living in the Northeast and Mid-Atlantic, NOAA gives us equal chances for above-, near-, or below-normal temperatures and precipitation. Check out Dr. Jeff MastersÃ¢â‚¬â„¢ Wunderblog for his take on the NOAA outlook. Meanwhile, the Accuweather.com long range forecasting team is predicting another cold and snowy winter for a large part of the country, due mainly to La NiÃƒ ±a. According to Paul Pastelok, expert long-range meteorologist and leader of the Accuweather.com long-range forecasting team, the North Central U.S. will bear the brunt of the 2011-2012 winter season. The way the jet stream is expected to be positioned during this winterÃ¢â‚¬â„¢s La NiÃƒ ±a will tend to drive storms through the Midwest and Great Lakes. Last year, the jet stream steered storms farther east along the Northeast coast, hammering the Interstate 95 corridor. Despite facing slightly less litigation in 2011 than in 2010, businesses in the United States and United Kingdom are seeing more regulatory actions and internal investigations, according to the Eighth Annual Litigation Trends Survey from international law firm Fulbright & Jaworski. More than one-third of corporate counsel polled in the U.S. and U.K. by Fulbright report there has been an increase in external regulatory inquiries directed at their companies. Further, more than one-quarter of respondents expect the year ahead will bring more litigation and regulation as companies attempt to grow in an economy that remains volatile. In 2011, 40 percent of survey respondents reported that one or more regulatory proceeding commenced against their company, continuing an upward trend that began in 2009. In both the U.S. and U.K., the rate of regulatory investigations is at a four-year high: 55 percent of U.S. companies (vs. 43 percent last year) and 27 percent of U.K. companies (vs. 26 percent last year) retained outside counsel for an investigation in the past year. Looking ahead, Fulbright reports that 91 percent of all respondents expect the number of internal investigations involving their companies to increase or stay the same, while 90 percent of those surveyed expect the number of regulatory proceedings will increase or remain the same. Respondents in the health care industry (21 percent) were most likely to expect internal investigations to increase, while energy and insurance sectors (both at 35 percent) led the way in anticipating a rise in regulatory proceedings. Check out I.I.I. facts and stats on litigiousness. For companies hit with a cyber attack the impact can be costly, both in terms of financial and reputational damage. New guidelines issued by the Securities and Exchange Commission (SEC) late last week urging publicly traded companies to disclose cyber incidents will give investors a greater appreciation of the nature of these risks going forward. A recent study by Symantec and the Ponemon Institute put the average organizational cost of a data breach at $7.2 million in 2010, and cost companies an average of $214 per compromised record up from $204 in 2009. The Identity Theft Resource Center (ITRC) notes that while many data breaches go unreported, more companies are revealing that they had a data breach, either due to laws or public pressure. Disaster preparedness, education, the environment, housing, senior issues, womenÃ¢â‚¬â„¢s issues, and youth and children are some of the local community projects that teams of insurance industry volunteers will be donating their time to next week. Volunteer Week, the Insurance Industry Charitable FoundationÃ¢â‚¬â„¢s (IICF) eight-day event, kicks off this Saturday on both the East and West coasts. During the week, teams of insurance volunteers will donate three or more hours of service at neighborhood and community nonprofit organizations. The IICF provides online signup for volunteer teams and coordinates contact with the charities for which volunteers work. Volunteer Week feeds insurance industry employeesÃ¢â‚¬â„¢ strong desire to give back to their local communities, and supports companies that want to be active players in their communities. Last year, the tri-state area saw more than 2,000 participants give more than 13,000 hours in nearly 200 different projects. Since it started in 1997, Volunteer Week has contributed more than 140,000 hours of community service. The U.S. property/casualty (P/C) insurance industry turned in a weak performance during the first half of 2011, as profitability slumped amid high catastrophe losses, according to I.I.I. president Dr. Robert Hartwig. Dr. Hartwig goes on to explain that Hurricane Irene, which caused an estimated $3 billion to $4 billion in insured losses during the third quarter, along with a slew of other catastrophes, will likely push the year-to-date tally above the $25 billion mark. Despite the slump in P/C insurance profitability, there was some good news. Premium growth remained positive (2.6 percent in first half), investment earnings were more robust than anticipated (net investment gains up 10 percent to $28.4 billion in first half) and policyholdersÃ¢â‚¬â„¢ surplus remained near its all-time record high ($559.1 billion as of June 30, 2011). The industryÃ¢â‚¬â„¢s results were released Friday by ISO and the Property Casualty Insurers Association of America (PCI).